In the past, my instinct as a baker has been to play around with lots of surprising ingredient combinations, specialty flours, or “sneaky” additions of healthful ingredients. That’s all well and good, but sometimes a girl wants a sugar cookie. 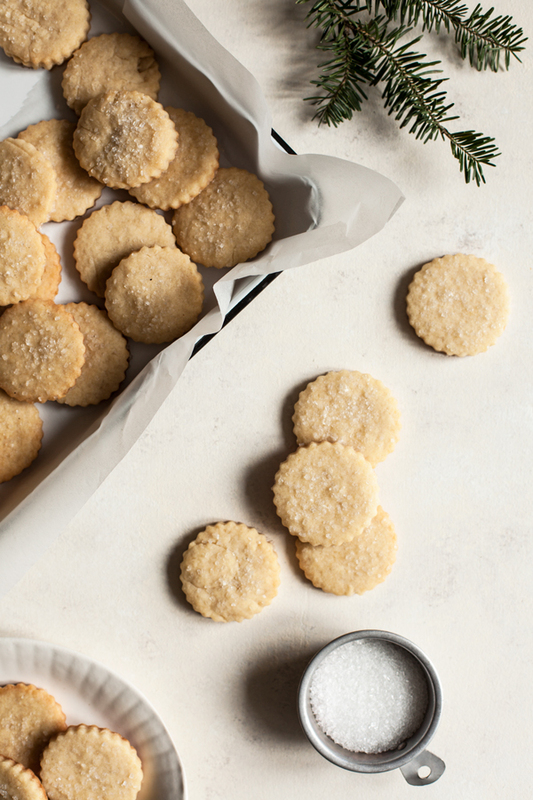 A traditional sugar cookie: something that’s reminiscent of holidays, childhood, and the characteristic smell of vanilla, butter, and sugar. 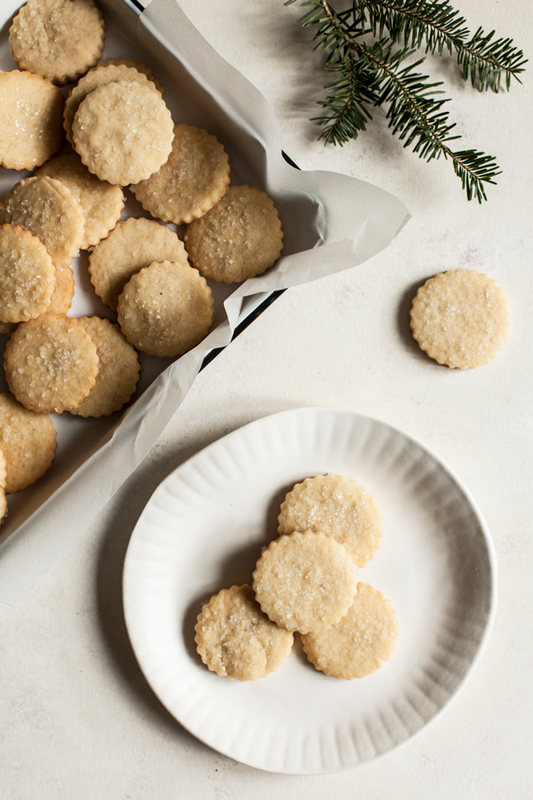 These vanilla almond sugar cookies are ever-so-slightly surprising, thanks to the hint of almond, but otherwise they’re exactly what they promise to be: a buttery, crispy sugar cookie that’s just the right amount of sweet. 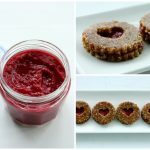 The first time I made this recipe, I used an old-fashioned cookie press. Then I realized that the dough wasn’t quite soft enough for a press; instead, it made a perfectly sturdy, crisp cut-out cookie. 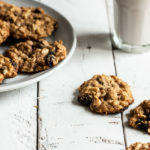 The recipe is reliable and forgiving, the kind of cookie you can make year after year, until you don’t really need to peek at the ingredients or the instructions anymore. If you’re feeling ambitious, you can decorate the cookies with homemade icing (a simple confectioners sugar and water mixture will work), but I think a sprinkle of coarse sugar is equally pretty, and it’s so much easier. The name says it all: I used both vanilla extract and almond extract in the cookies, and both flavors shine through nicely. If you don’t have almond extract, that’s fine: vanilla on its own will be lovely. And if you happen to have some fresh vanilla bean on hand, it’ll give the flavor an incredible boost. Place the vegan buttery spread and sugar into a stand mixer. Beat on medium high speed until the mixture is smooth, about 2 minutes. Beat in the aquafaba, then the extracts. Continue beating until the mixture is fluffy, about 3 minutes. Whisk together the flour, baking powder, and salt. Reduce the stand mixer speed to low and add the dry ingredients, gradually increasing the speed to medium low. When the flour is evenly incorporated, stop mixing. Divide the dough in half and shake it into two disks. Wrap them and place them in the fridge for at least 2 hours and up to overnight. Preheat your oven to 350F. On a clean, floured surface, roll the dough to ¼ inch thick and cut into shapes. Place the cookies on one or two parchment-lined baking sheets. Bake for 10-15 minutes, or until the cookies are just golden. Transfer the cookies to a wire rack and allow them to cool before enjoying. *To prepare a flax egg, mix 1 tablespoon ground flax meal with 3 tablespoons warm water and allow it to thicken up before using. The cookies can also be prepared with a handheld mixer. Cookies can be stored in an airtight container for up to 1 week. The dough can be made ahead and frozen for up to 1 month. The cookies can most definitely be made ahead: the dough will freeze for up to a month, and the cookies themselves can be stored for up to a week in an airtight container. 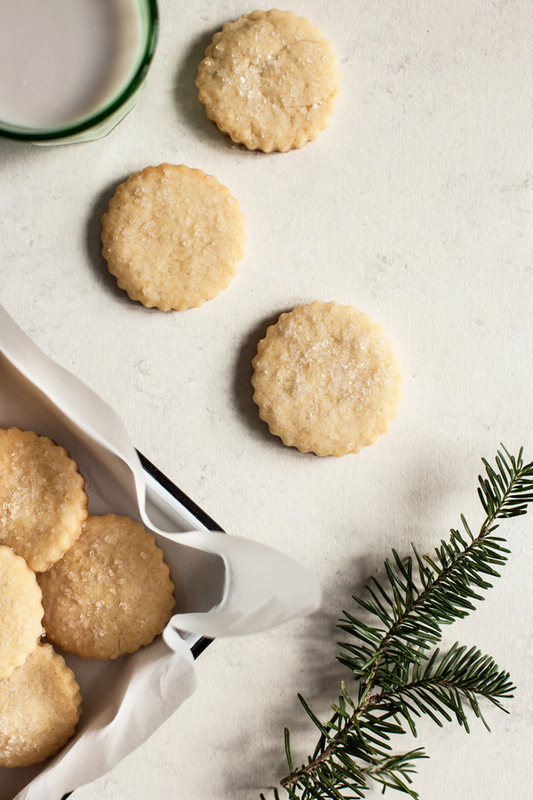 In spite of having a pleasantly crisp texture, they’re actually pretty sturdy, which means that they’re great for gifting, shipping, and so on. 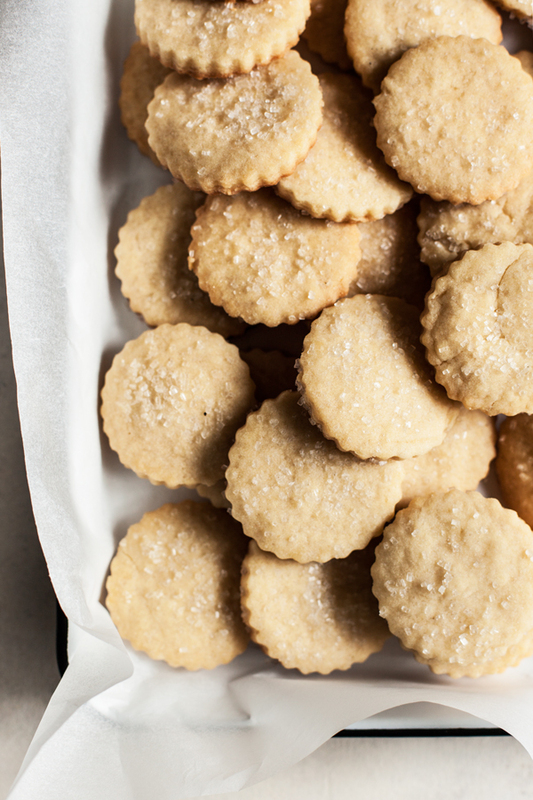 Like most cookies–especially sugar cookies–these are particularly good with a glass of cold milk. Whether you make these for the holidays, for fun, or simply to add a bit of brightness and sparkle to a cold winter day, I hope they give you joy. I want to eat every single one of these!!! 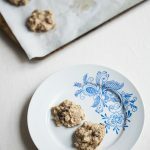 These look delicious, but if you’re using wheat flour in your cookies, you can hold the cookies together by developing the gluten in the flour. So you don’t need to add any egg or other binding ingredients. I add 2 tablespoons of water (or vegan milk) per egg or egg substitute and then use my hand kneading tool to develop the gluten. The cookies come out nice and tender if you don’t overbake them.